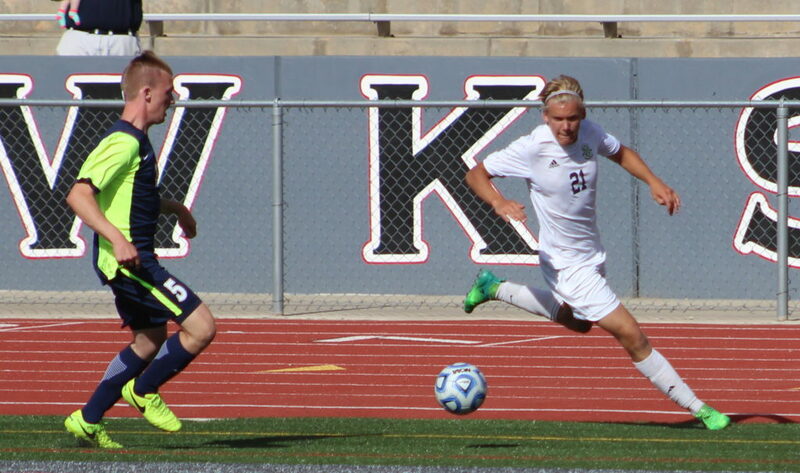 Warrior Benton Kemp (2) had several shots on goal and later scored a header, SC's only goal, Snow Canyon vs. Ridgeline, State 3A Soccer, Sandy, Utah, May 12, 2017 | Photo by AJ Griffin, St. George News. 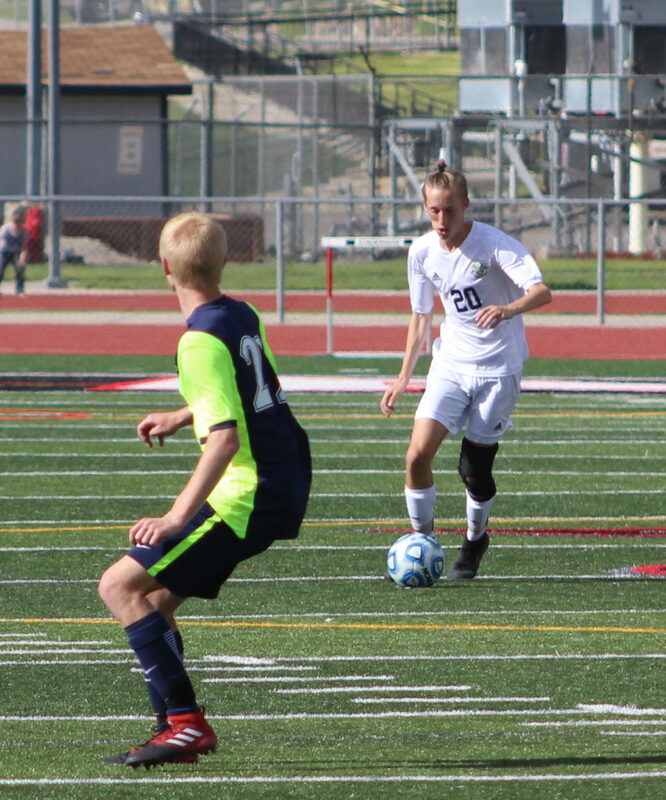 SANDY – The Ridgeline Riverhawks’ opportunistic high pressure defense proved to be just a little too much for the Snow Canyon Warriors as they knocked Region 9’s best out of the 3A state semifinals, 2-1, Friday at Alta High School. Ridgeline and Snow Canyon were locked in an epic battle at 1-1 late in the first half when Snow Canyon looked to pass back to the keeper and reverse the field. 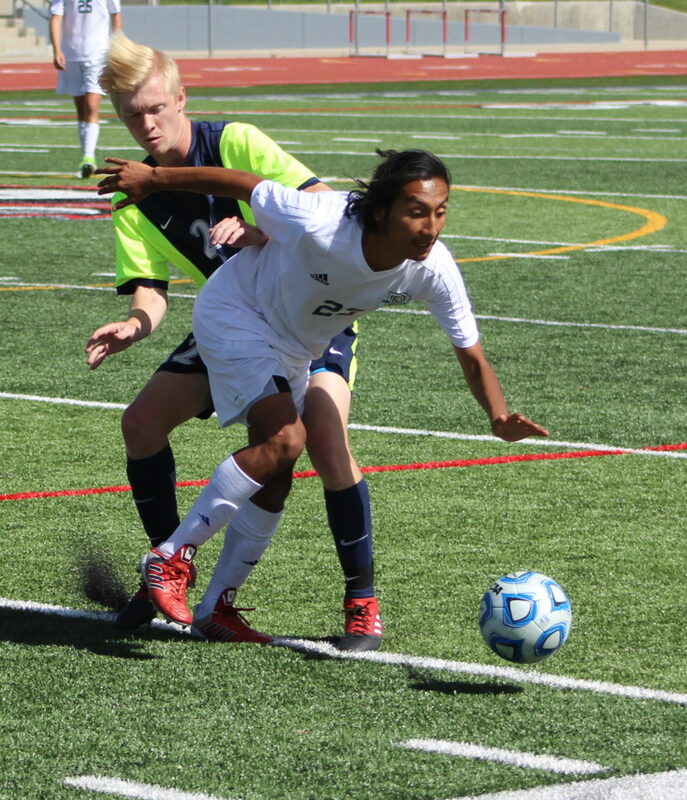 Riverhawk forward JC Vasquez pursued and got his body in front of the clearance just as Snow Canyon booted it away. The deflection had just the right English on it to creep into the goal and give Ridgeline a 2-1 lead just before halftime (39’). Ridgeline head coach, and the Senior JC Vasquez, beamed about his son’s hustle to produce what would prove to be the game-winning goal. SC’s Alexander Tholen (18) Snow Canyon vs. Ridgeline, State 3A Soccer, Sandy, Utah, May 12, 2017 | Photo by AJ Griffin, St. George News. The younger Vasquez described how he was able to come away with the go-ahead goal. In the second half, Snow Canyon fought hard for an equalizer, even finding the goal once on a play deemed offsides, but their efforts were to no avail. 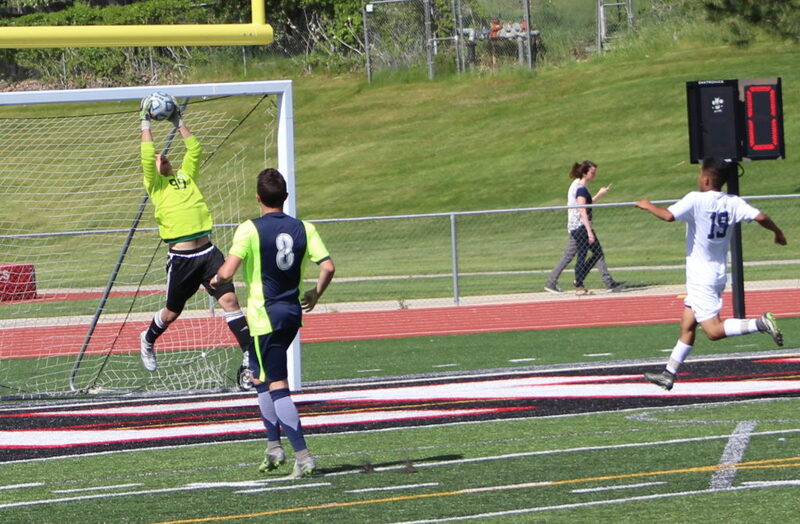 Ridgeline’s keeper, Joseph Venhaus, recorded several nice saves and ultimately held the Warriors to one goal in the match. In the first half, it appeared Snow Canyon would dominate the match. The Warriors controlled the ball, ruled ball-possession and pelted the goal with shots. 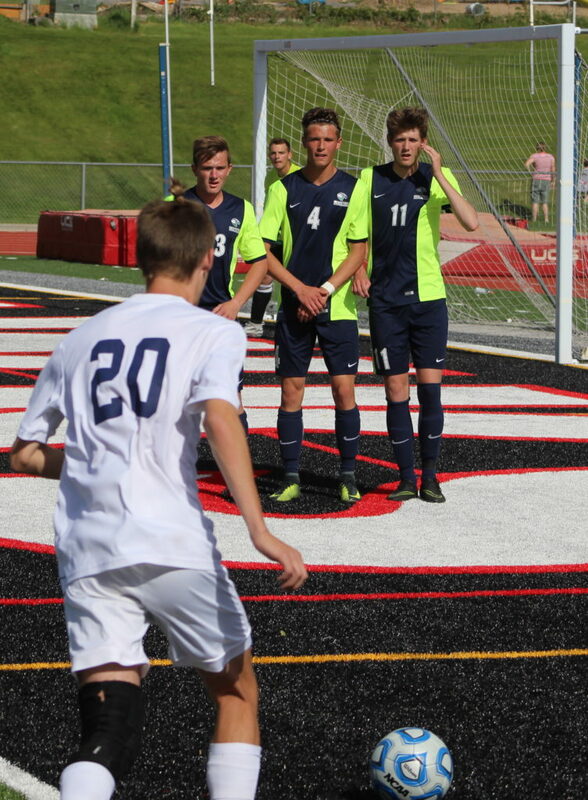 But Ridgeline still managed to strike first on one of its first shots on goal. Kelton Zollinger found himself at the right place at the right time after an impressive save from SC keeper Quinn Hargis. 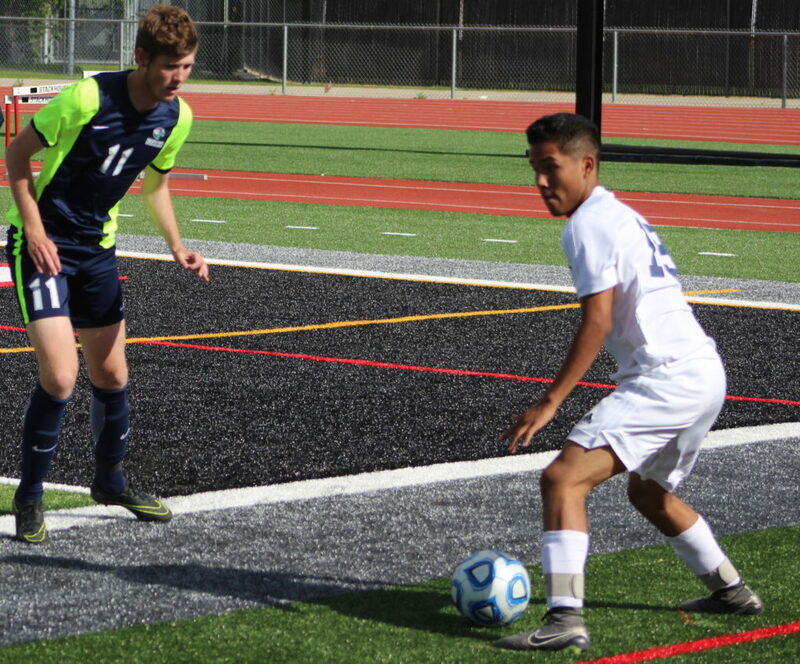 Riverhawk Mario Saldivar belted a strike on goal from 18 yards out. Hargis impressively extended a hand in front of the rocket, but unluckily deflected it right in Zollinger’s lap. Zollinger tapped it home as Hargis could but helplessly watch it roll (15’). 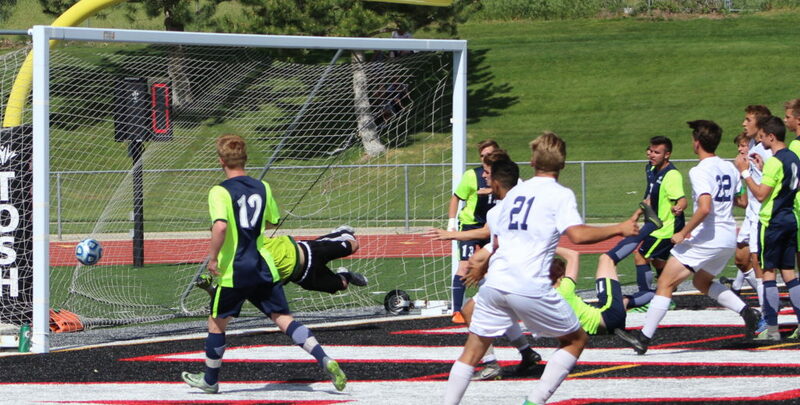 Snow Canyon responded quickly and matched Zollinger’s rebound with a goal of its own. In the 25th minute, SC’s Yetzel Carrillio teed up a beautiful floating corner kick that SC sophomore Benton Kemp put a head on. Kemp’s header crossed over the keeper and found far left corner to tie the match. 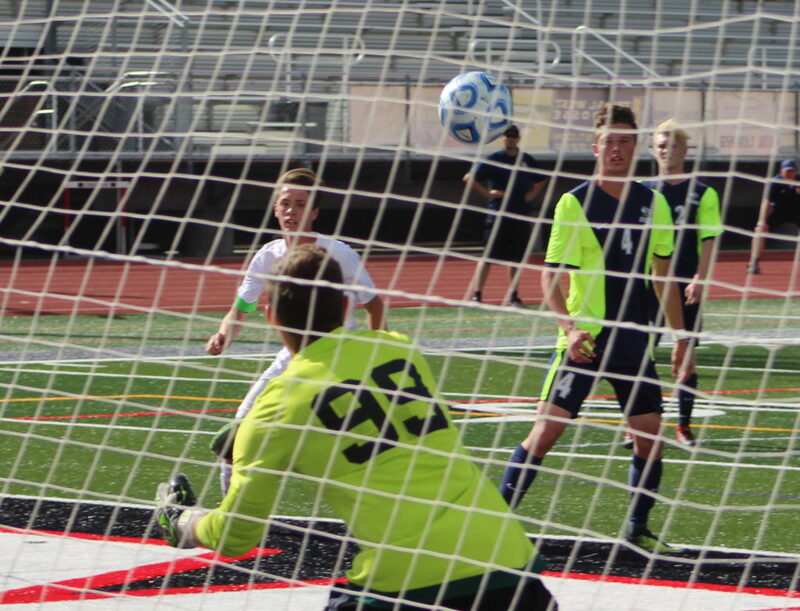 SC’s many shots on goal could only produce on score, thanks, in part to the performance of Ridgeline’s Joseph Venhaus, Snow Canyon vs. Ridgeline, State 3A Soccer, Sandy, Utah, May 12, 2017 | Photo by AJ Griffin, St. George News. Snow Canyon had several more good looks in the first half, but could not come away with the lead. 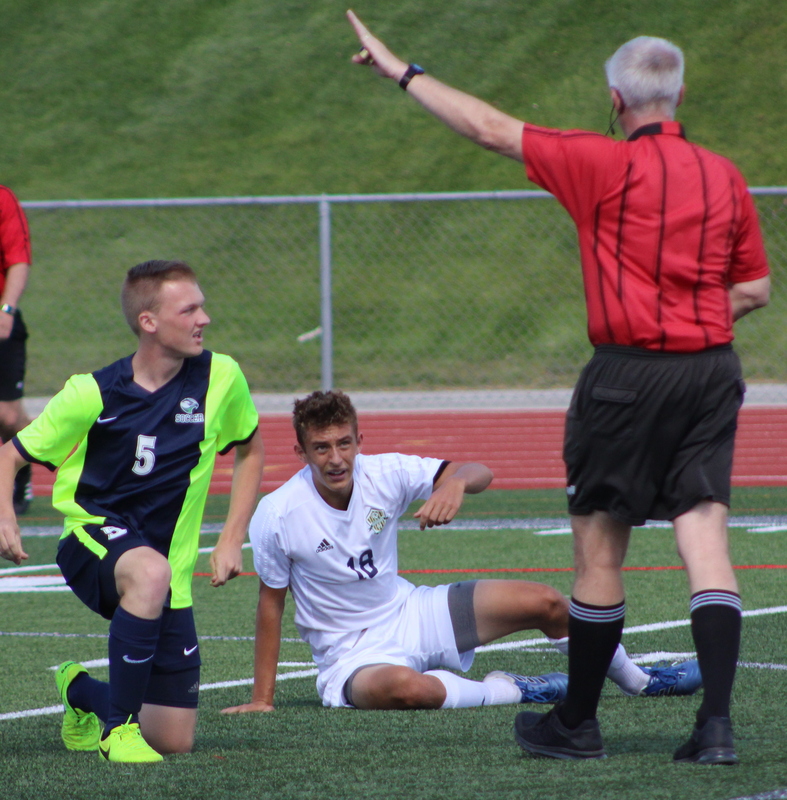 The Riverhawks, who struggled to find shots on goal for most of the first half, used pressure defense to force a miscue and grab the 2-1 lead going into halftime. Ridgeline parked the bus and cruised to victory after a scoreless second half. Coach Vasquez added that Snow Canyon’s second-half efforts made him nervous, but that his squad played disciplined enough to win the game. 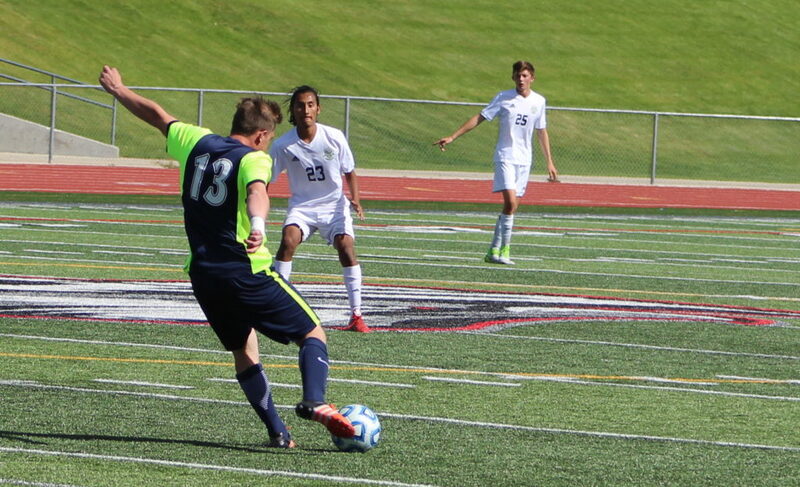 The Riverhawks improved to 14-2 and will face Juan Diego (14-2) in the 3A state championship Saturday at Rio Tinto Stadium. 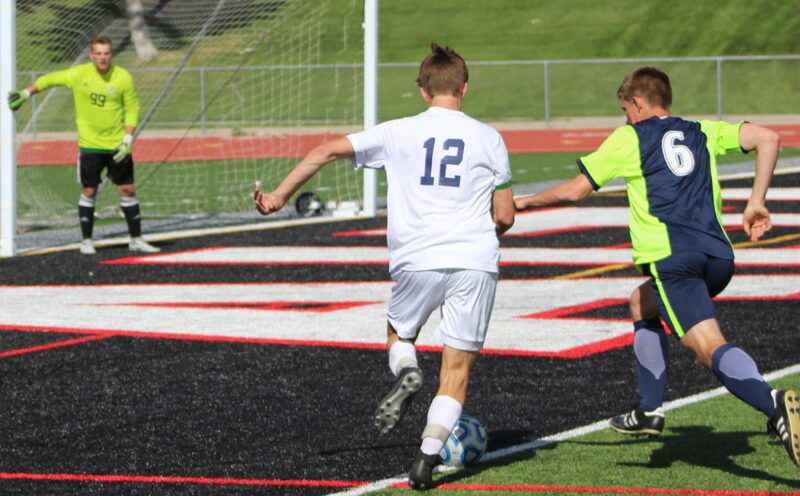 The Soaring Eagle defeated Logan 2-0 in the other semifinal. The Snow Canyon Warriors, who placed first in Region 9, finish their 2017 campaign with a record of 14-3-2. Dillon Hargis, Snow Canyon vs. Ridgeline, State 3A Soccer, Sandy, Utah, May 12, 2017 | Photo by AJ Griffin, St. George News. Kirk Brown, Snow Canyon vs. Ridgeline, State 3A Soccer, Sandy, Utah, May 12, 2017 | Photo by AJ Griffin, St. George News. Snow Canyon vs. Ridgeline, State 3A Soccer, Sandy, Utah, May 12, 2017 | Photo by AJ Griffin, St. George News. Kirk Brown (20) with a free kick, Snow Canyon vs. Ridgeline, State 3A Soccer, Sandy, Utah, May 12, 2017 | Photo by AJ Griffin, St. George News. SC's Max Kemp, Snow Canyon vs. Ridgeline, State 3A Soccer, Sandy, Utah, May 12, 2017 | Photo by AJ Griffin, St. George News. SC's many shots on goal could only produce on score, thanks, in part to the performance of Ridgeline's Joseph Venhaus, Snow Canyon vs. Ridgeline, State 3A Soccer, Sandy, Utah, May 12, 2017 | Photo by AJ Griffin, St. George News. SC's Alexander Tholen (18) Snow Canyon vs. Ridgeline, State 3A Soccer, Sandy, Utah, May 12, 2017 | Photo by AJ Griffin, St. George News. Yetzel Carrillo (23) assisted Kemp on SC's corner kick goal, Snow Canyon vs. Ridgeline, State 3A Soccer, Sandy, Utah, May 12, 2017 | Photo by AJ Griffin, St. George News. Benton Kemp (far right, in white) headed SC's 1st half equalizer past Ridgeline's Venhaus. Snow Canyon vs. Ridgeline, State 3A Soccer, Sandy, Utah, May 12, 2017 | Photo by AJ Griffin, St. George News.